Murray Pura was born and raised in Manitoba, just north of Minnesota and the Dakotas. He has published several novels and short story collections in Canada, and has been short-listed for a number of awards. His first books to be published in the United States are the inspirational works Rooted and Streams (both by Zondervan in 2010). His first novel to debut in the USA is A Bride’s Flight from Virginia City, Montana (Barbour), which was released January 2012. The second, The Wings of Morning, will be published by Harvest House on February 1. Both of these novels center around the Amish of Lancaster County, Pennsylvania. 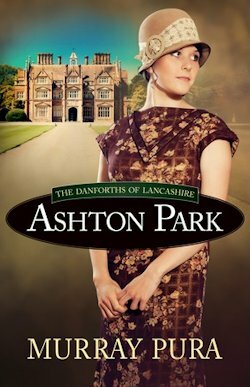 For fans of the hugely popular Downton Abbey series, comes this equally enthralling story of the Danforth family of Ashton Park. Among the green hills and trees of Lancashire, only a few miles from the sea, lies the beautiful and ancient estate of Ashton Park. The year is 1916. The First World War has engulfed Europe and Sir William's and Lady Elizabeth's three sons are all in uniform--and their four daughters are involved in various pursuits of the heart and soul. If you would like to read the first chapter of Ashton Park, go HERE.